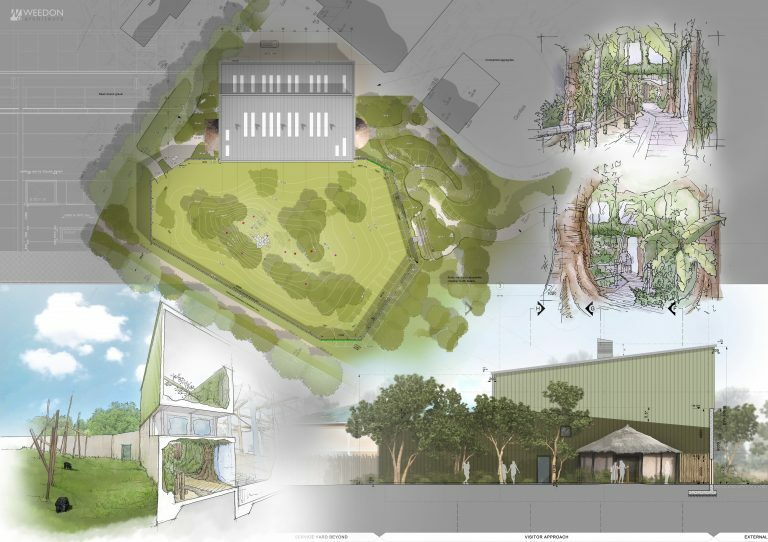 After planning permission was granted by Hinckley and Bosworth Borough Council in 2016, work began on a new immersive Chimpanzee enclosure that would emulate the natural habitats of their home nations. Africa Roofing were approached as a thatch and theming supplier and installer for this momentous project. 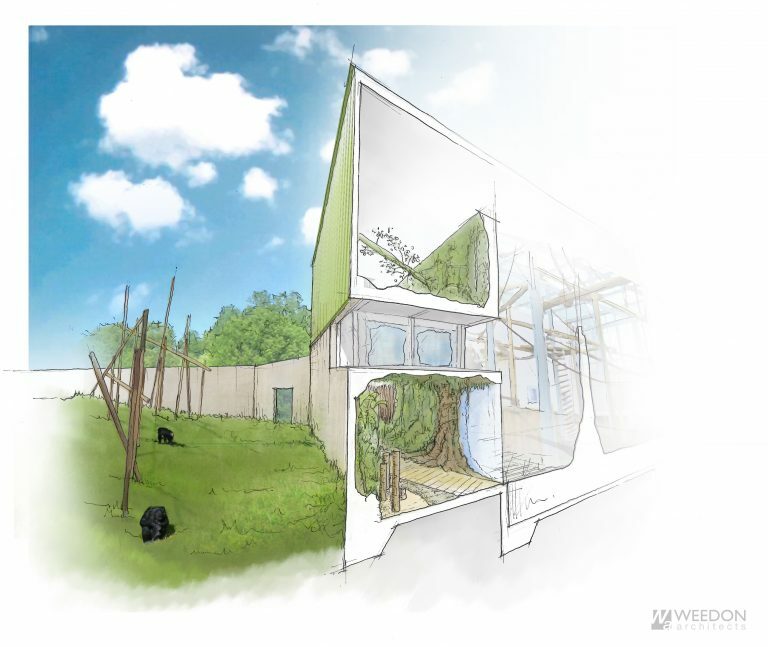 Designed to be like the chimpanzees natural homes in West & Central Africa, the latest new enclosure has officially opened at Twycross Zoo, a local attraction to Africa Roofing. This long planned facility will be the first time that all 18 chimps located in the park will live together in a single family group. Africa Roofing are delighted to have worked closely on the project to supply and install a roofing solution that is not only practical and functional, but also complements the habitat theming, emulating the natural habitat and encouraging natural behaviour within the animals. As pictured, the Chimpanzee Eden features a themed entrance, allowing visitors their first sight of the new immersive enclosure before stepping in to see the chimps thundering from side to side and over head. 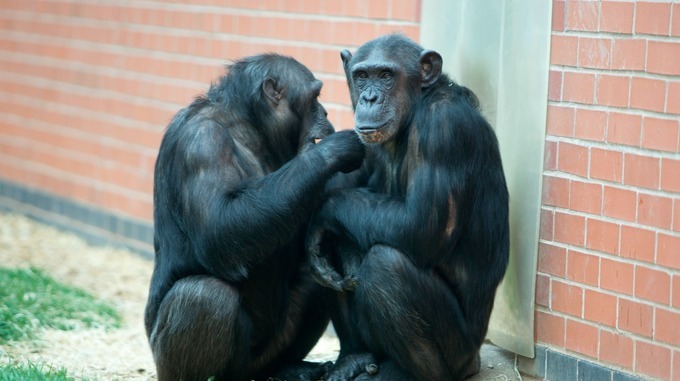 Twycross has been intrinsically linked with chimps since the days of its founder Molly Badham who famously provided the chimps for the 1950’s PG Tips adverts, so the investment is one close to the heart of the company. 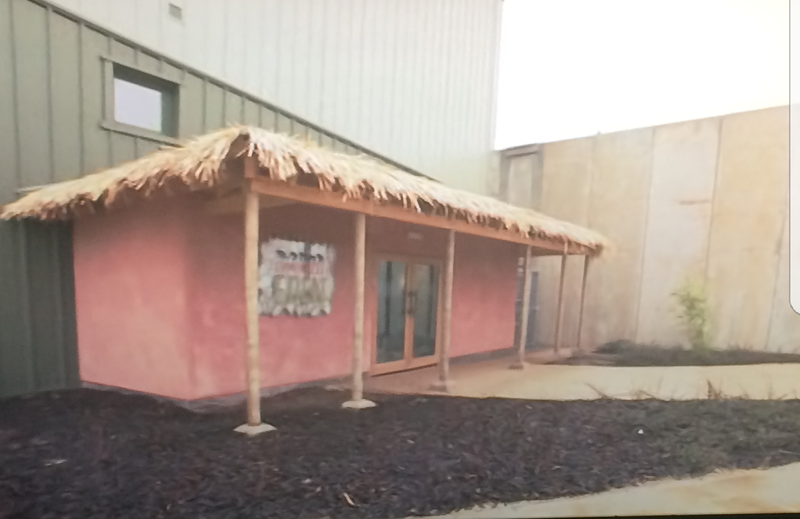 Africa Roofing supplied Fibre Palm, Bali thatch for the Twycross Zoo roofing project. Fibre Palm is a synthetic product which imitates palm thatch and has a tropical island aesthetic. It is manufactured into tiles, and boasts maximum life expectancy with minimal maintenance. Fibre Palm was developed as a realistic, long-lasting replacement for natural leaf thatch mediums. It is available in two formats, Bali and Makuti, both of which are synthetic imitations of the types of thatch commonly found in the Pacific Ocean, Caribbean and African Tropics areas. Fibre Palm tiles offer exceptional covering at 3 tiles per square metre. The tiles simply clip onto 8mm diameter rods in the usual overlay pattern spaced at 250mm. The tiles can also be stapled or nail onto wood roof battens. Fibre Palm tiles will provide a 98% waterproof roof covering. Our team delivered and installed the Bali tiles when required and are now delighted to see the finished result and see the official opening of the enclosure in Spring 2018.